The day will be at leisure for you to relax, enjoy the facilities of your hotel, and explore more of Athens on your own. You can optionally choose to take an afternoon tour visiting Cape Sounion and the temple of Poseidon. Early breakfast and transfer to the port for a day cruise to the Saronic gulf islands. First stop will be Hydra. A picturesque little "vehicle free" island, well-known to the international jet-set. Take a donkey ride, explore the little cobble-stoned streets and visit the Mitropolis at your own pace. Next, is the island of Poros with its clock tower facing the Peloponnese. Last comes Aegina, a weekend retreat for many Athenians. Enjoy a horse-drawn carriage ride or take an optional visit to the temple of Afea. Make sure to buy some pistachios, as Aegina is world-famous for its production. A buffet lunch will be served on board, and on the way back you will have to opportunity to see and participate to some traditional Greek dances! Return transfer to our hotel. Arrival in Heraklion early in the morning. Possibility of an optional excursion to the Minoan Palace of Knossos with the legendary Minotaur. In the afternoon we will arrive at the unique island of Santorini, where we will disembark and transfer to our hotel. Morning at leisure until the time to transfer to the airport for a short domestic flight, connecting with your international return flight home. *For the departure of 28/04 there will be NO VISIT to the site and the museum of ancient Olympia. will depart on day 02, and the city tour will be operated on Day 06 after the tour. may not be available or maybe altered. 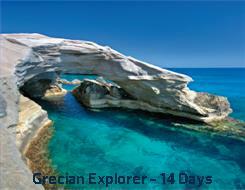 Accommodation on BB, 5 nights in Athens and 2 nights in Santorini. The 4-days/3-nights cruise to the Greek islands, with all meals, drinks package, port taxes and service charges, tips/gratuities on board, and the two above mentioned shore excursions included.